Did you know that February is National Cherry Month? Cherries are tasty snacks on their own, but they are also great on top of ice cream or baked into desserts. Celebrate the occasion by crafting these tasty desserts that incorporate cherries in one way or another. Preheat your oven to 350°. In a bowl, use an electric mixer to beat the butter and sugar at medium speed until fluffy; this takes about 2 minutes. Beat in the egg yolks and vanilla. Beat in the flour, cornmeal and salt and until a dough forms. Gather the dough into a ball and transfer to a large nonstick baking sheet. Cover with plastic wrap and roll it out to a 9-inch square that’s about a 1/4-inch thick. Bake for about 10 minutes until the edges are lightly browned. Immediately transfer the dough to a food processor and pulse until fine. Lower the oven temperature to 300°. Using foil, line a 14-by-4-inch, straight-sided rectangular tart pan that has a removable bottom. Spray the foil with vegetable spray. Press a 1/2-inch layer of the crumbs evenly over the bottom and up the side of the pan. Refrigerate until firm, 20 minutes. In a medium bowl, use an electric mixer to beat the butter with the sugar at medium speed until fluffy, which will take about 2 minutes. Add half of the mascarpone cheese and beat at low speed until combined. Add the remaining mascarpone cheese, the egg, vanilla, lemon zest and cream and beat just until smooth; this takes about 1 minute. Pour the filling into the crust and smooth the surface. Set the tart pan on a sturdy baking sheet. Position racks in the bottom and center of the oven. On the bottom rack, place a roasting pan filled with 1 inch of water. Place the tart on the center rack and bake for 35-40 minutes, until the filling is puffed and set. Let this cool to room temperature, then refrigerate for at least 2 hours until it chills. Lift the tart from the pan and remove the foil. Transfer to a platter. In a small saucepan, bring the sugar, Muscat and lemon juice to a boil. Reduce the heat to moderate and simmer until syrupy; this takes about 10 minutes. Let cool slightly, then transfer to a bowl and add the cherries. Let it stand for 10 minutes. Using a slotted spoon, transfer the cherries to the tart and serve. Prepare cake mix according to the package’s directions, using a greased 13-by-9-inch baking pan. Bake at 350° for 30-35 minutes or until a toothpick comes out clean. Dissolve gelatin in boiling water. Cool cake on a wire rack for 3-5 minutes. 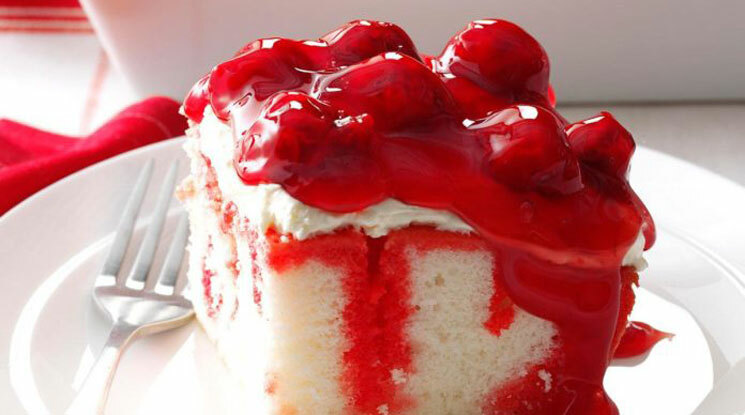 Poke holes in cake with a meat fork or wooden skewer, and gradually pour gelatin over the cake. Cool for 15 minutes. Cover and refrigerate for 30 minutes. In a large bowl, beat the cream cheese until fluffy. Fold in the whipped topping. Carefully spread over the cake, and top it with the pie filling. Cover and refrigerate for at least 2 hours before serving. Using a hand mixer, beat cream in a large bowl until stiff peaks form. This takes about 2-3 minutes. Fold in sweetened condensed milk and vanilla until fully incorporated, then fold in crushed graham crackers. Transfer half the mixture to a 9-by-5-inch loaf pan. Dollop a 1/2 cup of pie filling over the top, then swirl with a knife. Add the remaining cream mixture, then swirl in the remaining 1/2 cup of pie filling. Top with graham crackers. Freeze for at least 8 hours until it is firm, covering lightly with plastic wrap after 4 hours. Let it soften for 10 minutes before scooping and serving. Making the cherry pie filling: In a saucepan over medium heat, combine cherries, water, lemon juice, 1/2 cup of sugar, and cornstarch. Reduce heat to low and cook, stirring occasionally for 15 minutes. Spray a muffin tin with nonstick spray. Use the rim of a glass to cut large circles into the pie crust (they should be big enough to line the whole muffin cup). Press the crust into muffin tins and up the sides. Spoon over filling until each cup is full. Roll out the remaining scraps of pie crust and slice into lattice strips with a pizza cutter or knife. Make a crosshatch crust and trim the excess. Brush tops with milk and sprinkle with your remaining sugar. Bake at 350° for 23-25 minutes. Let cool slightly, then remove from muffin tin and serve.